First revision: September 20, 2017. A section on pitfalls of validation tests was added. It was about time that someone spoke up about the perils of chart analysis, back-testing and data-mining clearly and honestly. In this book you will learn why naive chartists and quants have no chance of profiting from trading the markets and how expert chartists and quants attempt to maximize their winning odds. There are many examples that illustrate the points made in the book. Click here for the full table of contents. You may subscribe below. Price: $60/year. A free extension of the subscription period will be provided upon request. 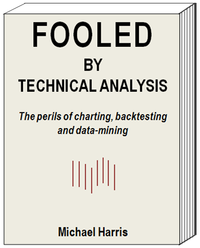 Bonus: A free subscription to the book 15 Lies About Trading And Investing. Online book subscribers do not receive a hard copy, ebook or PDF. Instead they can use the username and password selected below to read the books online. Note: there are no refunds for cancellations. After subscribing you can download a receipt from your subscription details page. No access to other premium content. Online book subscribers cannot access other premium content unless the subscription is upgraded for that purpose. © 2015 – 2018 Michael Harris. All Rights Reserved. Any unauthorized copy, reproduction, distribution, publication, display, modification, or transmission of any part of this blog is strictly prohibited without prior written permission.